This family is popularly believed to be a branch of the Grahams of Gartmore in Scotland. It is possible they came to London around the time the Stuart Kings came south in the early or mid 17th century. 1. Elizabeth Graham, who married Edward Pincke on 12th May 1715 in Westminster (Edward's younger brother Alured later married Elizabeth Thornicroft, Dowager Baroness Abergavenny). They had issue. 2. Sarah Graham, who married Henry Monger, perhaps of Faversham in Kent, on 8th October 1717 in Westminster. They had issue. 1. Henrietta Catherine Graham, apparently born at Wotton in Surrey on 8th November 1733 and baptized at St.James's, Westminster on 30th November 1733. On 6th May 1752 she married Sydenham Malthus of The Rookery and Albury in Surrey. They were second cousins, being related through the Portman family. 1. Richard Robert Graham, of whom later. 2. Thomas Graham, born 18th August 1740. He died young, probably in 1742. 2. Anna Maria Graham, born 7th July 1738 and baptized at St.James's, Westminster on 1st August 1738. She was to marry (as his 2nd wife) THOMAS RYVES of Ranston Hall in Dorset at St.James's, Westminster, on 22nd September 1757. In 1742 Daniel commissioned William Hogarth (1697-1764) to paint his children. When Hogarth began to sketch the children for the work, the youngest child Thomas was still alive. However by the time the painting was completed later that year, the youngster had died. This probably accounts for what are said to be some symbolic references to death appearing in the portrait, such as the winged cherub carrying a sickle above a clock in the background behind him. The Graham Children as painted by Hogarth in 1742. 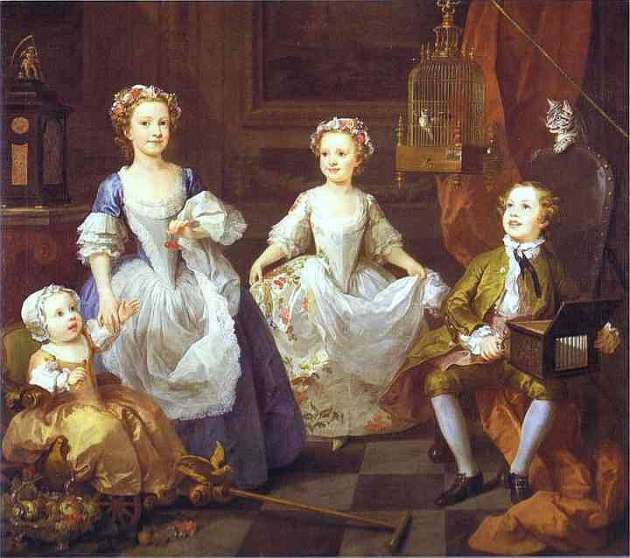 The children are (from left to right) the infant Thomas sitting in a gold-leaf gilded go-cart; Henrietta in a blue dress holding two cherries; Anna Maria in a flower-print dress; and Richard who plays the sérinette (bird organ). Celebrated for its somewhat idealistic portrayal of childhood, it is also said to be Hogarth's most ambitious portrayal of children. Measuring over 160 x 180 cm, It has become one of the most famous paintings of its genre and is now in The National Gallery, Trafalgar Square, London. It also shows what a comfortable lifestyle this family enjoyed. 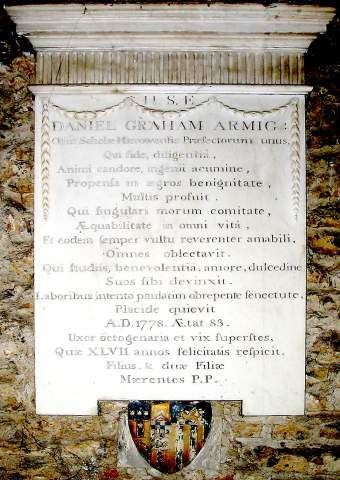 Daniel Graham died in 1788 and was buried in St.Mary's Church, Harrow on the Hill where there is a wall plaque to his memory (see right). Below it can be seen the arms of the Graham family. His will was proved on 27th March 1778. (a). Richard Robert Graham, born in Hayton about 1816. In 1851 he was a farmer, living with his parents. (a). Laura Sophia Graham, born in Yorkshire about 1814. In 1851 she was still unmarried and living with her parents. 2. Robert Thomas Graham, baptized at the Pensioners Army Hospital on 28th May 1775. 3. Henry Graham, born about 1778. 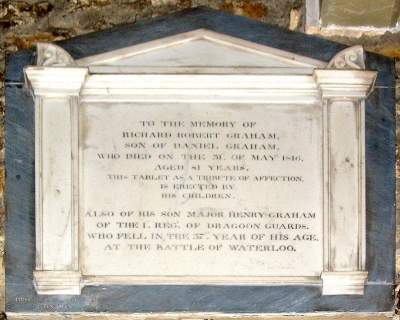 He was killed at the battle of Waterloo on 18th June 1815 and is mentioned on his fathers monument in St.Mary's Church, Harrow on the Hill (see left). 1. Maria Uriana Graham, baptized at the Pensioners Army Hospital on 8th July 1768. 2. Henrietta Graham, baptized at the Pensioners Army Hospital on 3rd June 1770. 3. Maria Anne Graham, baptized at the Pensioners Army Hospital on 6th July 1770. 4. Emma Graham, baptized at St.James, Westminster on 20th December 1779. In 1806 she married, as his 2nd wife, her cousin Admiral George Frederick Ryves (1758-1826). 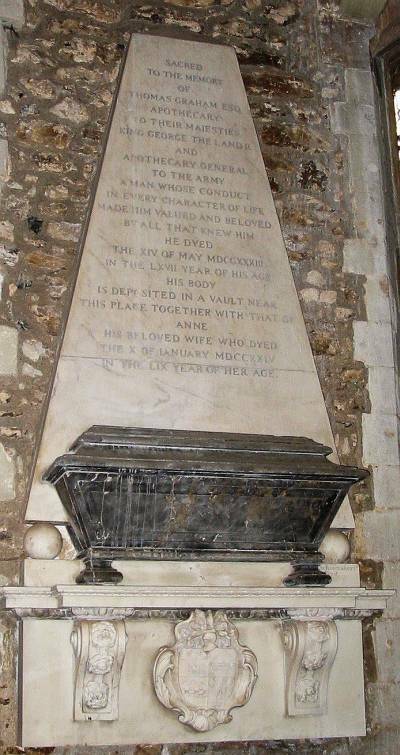 She died his widow and was buried at Parkstone in Dorset. Her will pr. 28th November 1842. They had issue (see Ryves). 5. Margaret Graham, born 16th September 1781 and baptized at Saint Mary-St Marylebone Road on 15th October following.